Recombinant full length protein corresponding to Human GCET1. 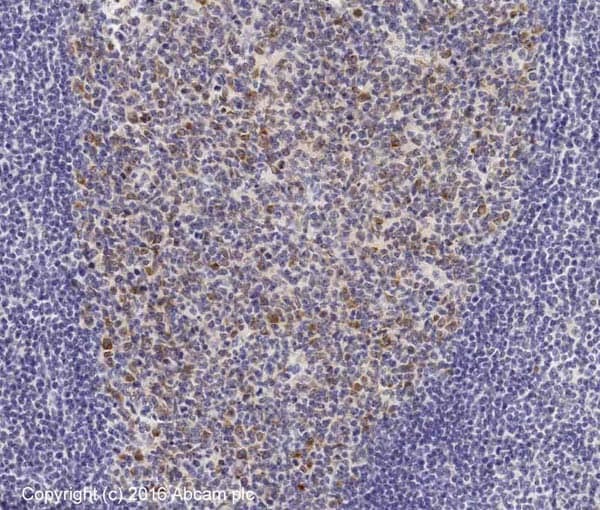 IHC-P: Human Burkitt's Lymphoma, Follicular B Cell Lymphoma, Diffuse Large B Cell Lymphoma and Lymphocyte Predominant Hodgkin's Lymphoma tissue. Human tonsil tissue. WB: Transfected cell lines. This antibody was purified using a AKTA prime. Our Abpromise guarantee covers the use of ab68889 in the following tested applications. WB 1/100. Detects a band of approximately 46 kDa (predicted molecular weight: 47 kDa). Protease inhibitor that inhibits trypsin and trypsin-like serine proteases (in vitro). Inhibits plasmin and thrombin with lower efficiency (in vitro). Highly expressed in normal germinal center (GC) B-cells and GC B-cell-derived malignancies. 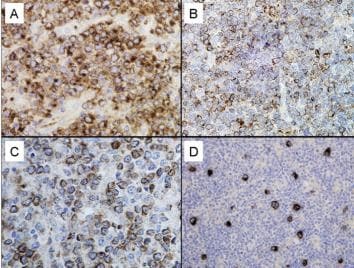 Ab68889 staining human GCET1 in Burkitt's Lymphoma (A), Follicular B Cell Lymphoma (B), Diffuse Large B Cell Lymphoma (C) and Lymphocyte Predominant Hodgkin's Lymphoma (D) by immunohistochemistry using formalin fixed, paraffin embedded tissue. IHC image of GCET1 staining in human tonsil formalin fixed paraffin embedded tissue section*, performed on a Leica Bond™ system using the standard protocol F. The section was pre-treated using heat mediated antigen retrieval with sodium citrate buffer (pH6, epitope retrieval solution 1) for 20 mins. The section was then incubated with ab68889, 10µg/ml, for 15 mins at room temperature and detected using an HRP conjugated compact polymer system. DAB was used as the chromogen. The section was then counterstained with haematoxylin and mounted with DPX. 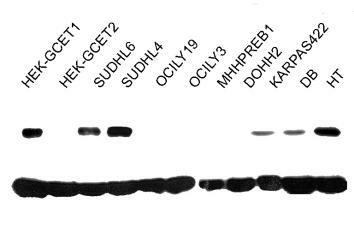 Western blot results of GCET1 from transfected cell lines. The first two lanes demonstrate the specificity of ab68889 (1:100) on lysates of transfected HEK-GCET1 cell lines. A 46kDa band specific to the GCET1 protein was observed in GC-DLBCL (SUDHL4 and SUDHL6) and some other DLBCL (KARPAS 422, DB and HT). The GCET1 protein was not present in a subset of DLBCL (MHHPREB1, DOHH2). The top bands show the GCET1 protein, whereas the bottom bands are GAPDH, used as a reference. 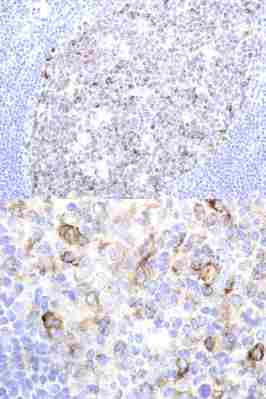 Ab68889 staining human GCET1 in human tonsil by immunohistochemistry using paraffin embedded tissue. Publishing research using ab68889? Please let us know so that we can cite the reference in this datasheet. Kindly confirm if Anti-GCET1 antibodies (https://www.abcam.com/GCET1-antibody-RAM341-ab68889.html & https://www.abcam.com/GCET1-antibody-ab86673.html) of Abcam are validated for Ventana, as enquired by the customer. Unfortunately, we do not validate our antibodies on any automated system. Inquiry: Is your Anti-GCET1 antibody an IVD? Both of our GCET1 antibodies, Ab68889 and Ab86673, are research use only antibodies and are not approved for diagnostic usage. I hope that this information will be useful, but if you have any further questions or need anything else, please let me know and I'll be happy to help. Thanks for your email. ab4587 does not have any required MSDS information, so a link will not be present on this datasheet. For example, ab7254 does have a link to MSDS information. I hope this helps. Please contact me again if you have any further questions. Thanks for your enquiry. If required, MSDS information is located via one or more 'MSDS' links near the top left corner of the online datasheet. This link is just below the 'Datasheet PDF' link present on all datasheets. I hope this is helpful. Please contact me again if you have any further questions. We have purchased GCET1 (ab68889). We need to know the expiration date for this antibody. It is not indicated on the vial or the accompanying paperwork. Thank you for contacting us. We do not have expiration dates for our products. But we do guarantee all our products for tested species and applications as listed on the datasheet. The guarantee is valid for 6 months after a purchase. For more details about our Abpromise guarantee please check this link: https://www.abcam.com/abpromise. The recommended longterm storage for the antibody is -20 or -80 degree. Therefore the product should be viable for up to 5 years. I hope this information is helpful to you. Please do not hesitate to contact us if you need any more advice or information.